A fifty-two year old lady wants to have lifting of the marrionette and nasolabial folds (commonly called the parenthesis). The folds are moderately deep and she has never had anything done before and her consult provider tells her “you will do great with one syringe of filler to improve the fold”. In addition, the consulting provider tells her the filler will not be put in the fold but it will be near the corner of the eye to lift the fold (think three inches away). This recommendation makes us want to laugh at Charmed in addition to a little frustration. This plan for one syringe is deceptive and will not provide a result. If the lady decides to trust in that consult plan, she will then be highly dissatisfied with her result and she will lose faith in dermal filler and what it can accomplish. Unfortunately, we hear of these inadequate plan and we have to educate the client that dermal filler results can be over-the-top satisfying but you have to get the right amount of filler in the right area especially the first time. One syringe of filler is good often in the lips, lip lines, between the brows or within the brows to lift them, acne or traumatic scarring, and in the under eye depressions. One syringe may also be great for touchups of filler after you have obtained the optimal result and want to keep the result. But one syringe of filler is not an appropriate plan to lift the face and improve moderate to deep folds. 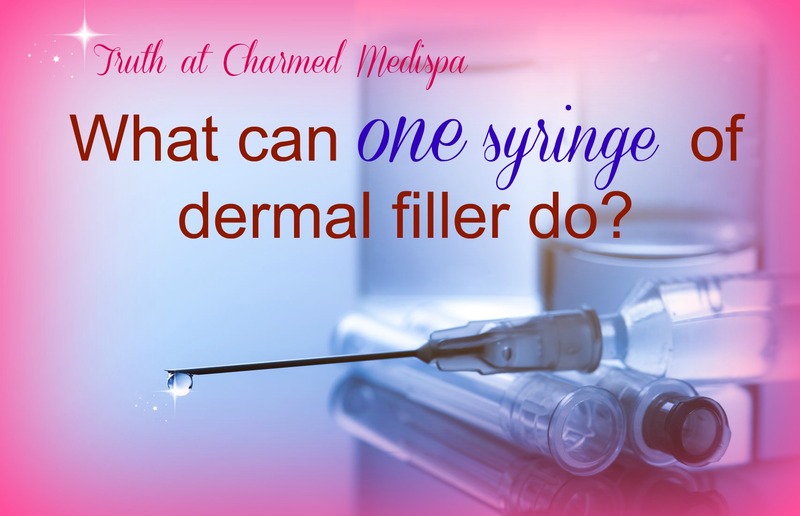 Did you know that one syringe of filler is only 1/5 of a teaspoon? Not that much, right? At Charmed Medipsa we want your results to be exceptional. With the right resources, we can give you results that make you forget about your concern in the first place! Dermal fillers like Restylane, Juvederm and Voluma are dermal filler options and are bio-identical hyaluronic acid which is a substance your body naturally produces. If you’re considering dermal filler, make Charmed Medispa your rejuvenation destination with expert injector, Loraine Olson, RN, who pioneered filler in Delaware and trains physicians on the fine art of injection techniques. Charmed Medispa offers dermal filler, Botox, lasers, chemical peels, medical grade skin care, skin tightening, Sculptra, IPL and so much more in Newark, Delaware.